When New World Library first published Valerie Ann Worwood's book 25 years ago, its subject matter was new to most. But readers latched onto it and over the years it has become the trusted, tested, last word in its field. Because The Complete Book is, well, so complete, it has taken Worwood several years to complete a revision. Worwood now builds on the way aromatherapy has become accepted in medical and mental health care, in hospitals and office buildings, and even as antimicrobials and tumor antigens. 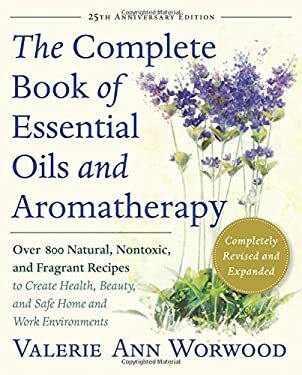 In her clear and positive voice Worwood offers readers tools for common basic care, self defense against the contaminants around us, emotional issues, and a plethora of concerns particular to kids, women, men, and even travel and beauty. She also addresses the most common issues of aging -- all in a way that offers proven, natural, and nontoxic comfort and care. New (564 available) BRAND NEW. Over 1.5 million happy customers. 100% money-back guarantee. Make your purchase count: support Better World Books' worldwide literacy partners.